Apollo makes use of the power within his bloodline hinted at by the Seraphs. The cover of this issue depicts a Viper with a nose missile similar to those seen on Vipers in "First Date". 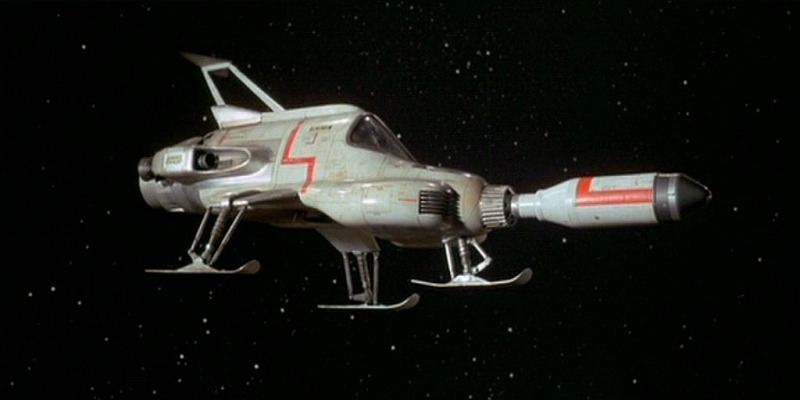 This makes the Vipers look a bit similar to a SHADO Interceptor from the Gerry and Sylvia Anderson TV series UFO (1970-71). Cover Vipers in "First Date". 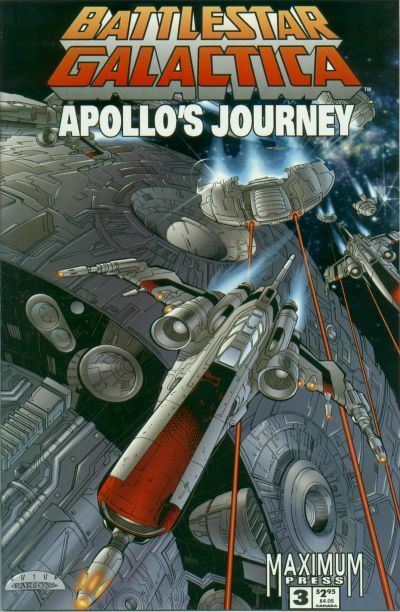 On page 1, Apollo tells Sheba that Count Iblis transported the Borellian Nomen from their Earth Colony to the Galactica as part of his plot. But that's not quite accurate: the Nomen were never on Earth, they were still being held on the prison barge at the time, as seen in "Apollo's Journey" Part 1. 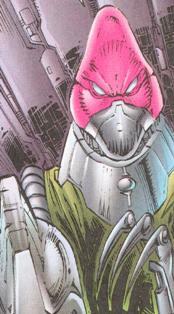 Page 2 reveals that Colonel Boomer is acting commander of the Galactica with Apollo missing and Athena held hostage with the bridge crew by the Nomen. 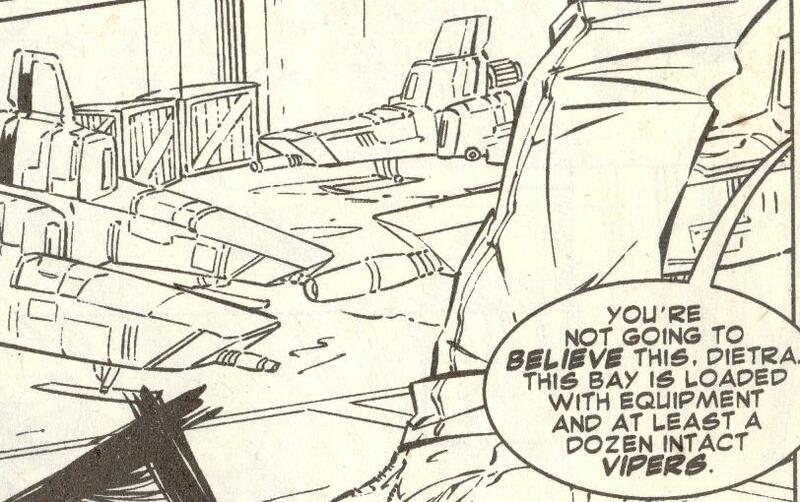 On page 6, we get our first look at Spectre Mark VIII, previously mentioned as the commander of the Cylon attack fleet headed for Earth in "Apollo's Journey" Part 2. 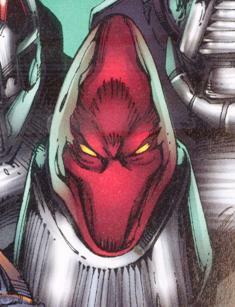 Spectre has a similar, but more metallic, appearance to Lucifer. Also on page 6, as the Cylon attack fleet emerges from warp and scans for Earth, a centurion informs Spectre that the legendary planet is not detected, nor do any Type 7 planets exist in the system. This is the first expression of the term "Type 7 planet" in the BSG universe. It may represent the Cylon designation of a human habitable world. 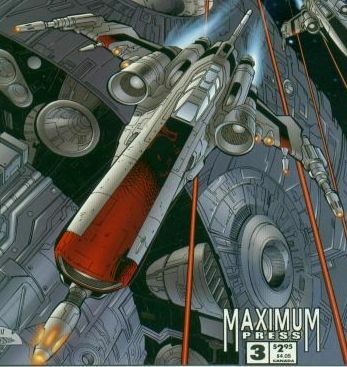 On page 11, we see a large number of Nomen facing off against the boarding party from the Pegasus. We've had no previous information in this storyline that there were any more than just the three Nomen Maga, Bora, and Taba. The number of Nomen seen here also conflicts with the numbers of Nomen left alive as described in the Hatch novels. Here we see at least 12 Nomen, probably more unless some of the figures in the background crowd are regular humans who have joined the Nomen mutiny. There even appear to be some Nomen attacking the ark on Earth on page 15, but I prefer to think they are just human convicts released from the prison in New Eden City (as seen in "Apollo's Journey" Part 2). On page 13, Iblis announces to Apollo he's willing to kill him and "subvert another descendant of Kobol and use him to wield the amulet--as I planned to use you!" to which Apollo responds, "Her? Athena?! No!" But Iblis said "him" not "her"! What are the secrets of Adam's ark that he has not revealed to the Colonials? Both Count Iblis and Adam himself suggest there is something more to the ark.